Gourmet Wine Getaways creates wonderful private events for entrepreneurs, businesses, affinity groups, charities or just a gathering of wine and food-loving friends that enjoy each other’s company. We are your best resource for unique and entertaining Development, Fundraising, Donor Appreciation & Client Thank You Events. Wine has become increasingly popular, both as a beverage as well as a topic of conversation. Adding this intriguing element will not only make the event more enjoyable, it is likely to increase attendance. These events can be wine dinners or wine/appetizer events in a public or private venue in the Greater Los Angeles region. Or, it can be a wine tasting day trip to Santa Barbara County’s Wine Country just a short drive up the 101 Freeway. Each event is customized to suit the specific needs and desires of the client. From 10-250 guests, each event will be attractive, fun and designed to exceed expectations. Multi-course wine tasting dinners featuring 4-5 wines are normally held at restaurants but can take place at private homes, art galleries or business offices. A winery or wine theme is chosen and then appetizers are selected to pair with the wines. Venues include private homes, business offices & art galleries. Learning about wine has never been so much fun! History, science and art come together as guests learn the tips to wine tasting, wine selection & the art of wine and food pairing. 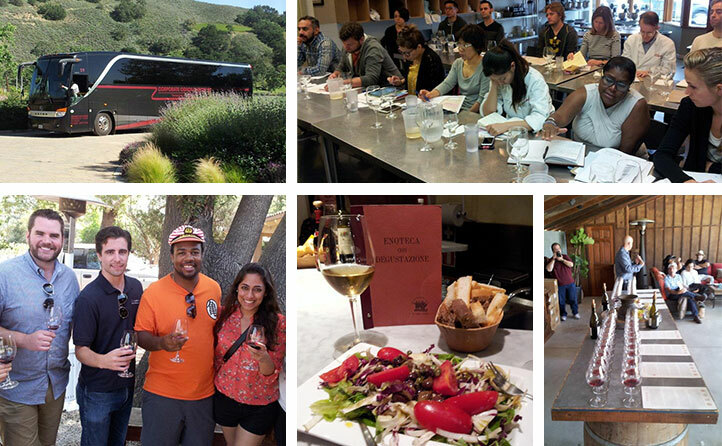 Day trip or long weekend – your group of 10 to 45 guests will drink world-class wines, enjoy gourmet cuisine, meet winemakers, tour in luxury and enjoy the incredible area that is Santa Barbara County Wine Country. Best of all, we’ll handle all the driving so you can sit back, relax and take in the beautiful scenery. Let Gourmet Wine Getaways make your next event/celebration unique, fun and memorable! Where might I have a private wine tasting dinner? What is the smallest number for a private wine tasting dinner or wine/appetizer event? Private wine dinners can be as small as 10 guests or as large as 250 guests. The smaller size events are normally done in private homes or at an art gallery. Wine dinners at a restaurant or a wine/appetizer event at a private home, business office or art gallery require a minimum of 30 guests. Can I have a private wine dinner or wine/appetizer event on any night of the week? The event can be any night of the week or even a weekday afternoon. The specific venue will normally dictate the availability. If you are flexible regarding venue, GWG can normally accommodate your day of the week request. What is the difference between a private wine tasting dinner and a wine/appetizer event? Wine Tasting dinners are normally at a restaurant and are conducted in a sit-down format (after a welcome reception). The dinner is normally 4 courses and guests remain in their seats throughout the meal. A winemaker or special guest from the winery attends. Each food course is paired with a different wine. Wine/appetizer events are normally held at private homes, business offices or art galleries. The format is stand-up and circulate with tables/chairs. Appetizers (either plated or passed) are provided throughout the event and all of the featured wines are available to taste throughout the event. Thus, it is less structured and allows for mingling and networking. 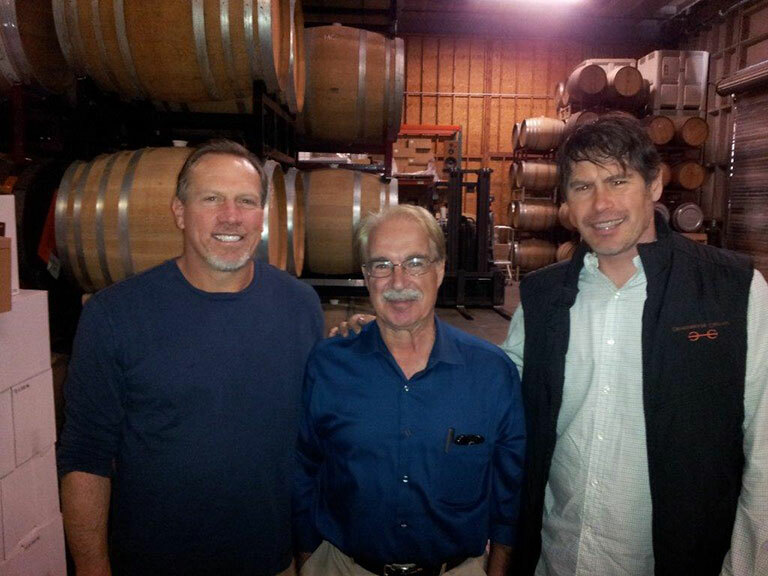 A winemaker or winery guest can be in attendance or GWG’s Peter Kerr can conduct the event solo. With Peter hosting the event alone, this allows the wines to come from more than one winery and be a part of a chosen wine theme (California PNO’s vs. Oregon PNO’s). How far in advance do I need to reserve for private wine event? In general, the more time to plan, the easier it is. Events at public venues such as restaurants or art galleries require a minimum of 60 days but starting to plan further out is even better and helps to ensure a successful event. What are my options regarding a private wine tasting trip? Wine tasting trips can be 1-day, a long weekend or even longer if desired. 1-day trips are by deluxe motor coach to Santa Barbara County Wine Country. Long weekend trips are either to Santa Barbara County or Paso Robles Wine Country. In this case, the guests drive to the wine region in their own cars and then GWG provides a motor coach during the wine tasting weekend. 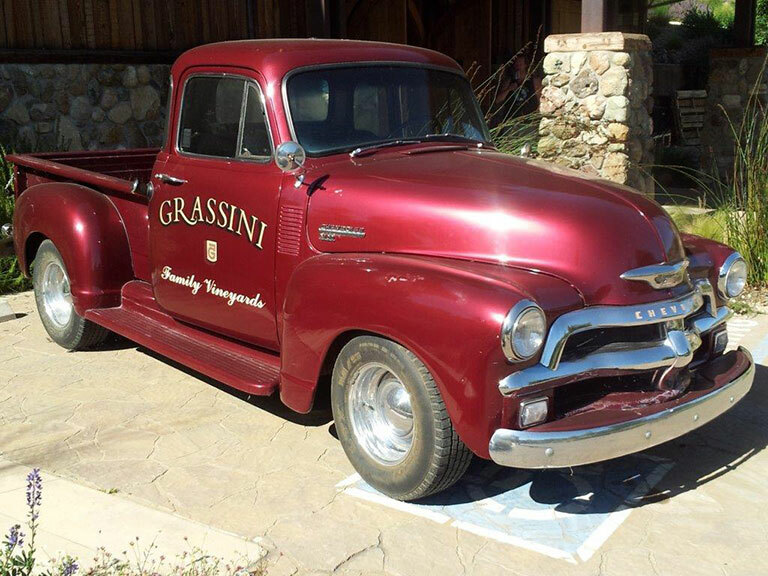 Who selects the wineries to be visited on the wine tasting trips? GWG normally selects the wineries but if you have a special winery that you wish to visit, GWG will do its best to include it. What is the extra benefit of using GWG to plan and create the wine trip? GWG’s 20+ years of taking guests wine tasting has allowed us to develop excellent working relationships with a number of excellent wineries. These relationships translate into a unique experience for our guests at the wineries we visit. Special behind the scenes elements are a part of the visit and tastings include “off menu” wines. What is the smallest group size for a wine tasting trip? Yale Alumni Association of Southern Calif. It was a delight to have intimate discussions with truly knowledgeable experts. On top of that, it was great fun. Peter was a gracious, knowledgeable host…ever smiling and eager to answer even the simplest and most naïve questions.